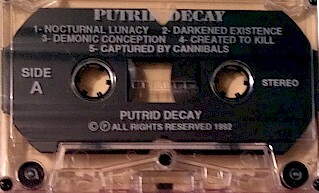 Death Thrash band Putrid Decay formed in Indian Orchard, Ma around 1991 releasing one demo. Band members were Jimmy Blair - Guitar , Damien Guerin - Vocals , Eric Lucas - Drums, Brian Nedeau - Bass , Paul Stasiak - Guitar. Xeroxed covers. Pro printed tapes.